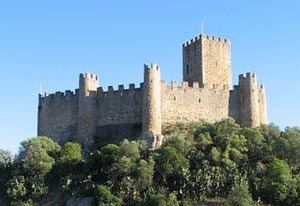 Almourol Castle is situated in the small Almourol island in the middle of the Tagus river (rio Tejo), in Praia do Ribatejo, a parish in Vila Nova da Barquinha, Central Portugal. 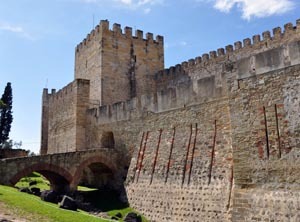 The castle was a Knights Templar stronghold used during the Reconquista. The castle and the tiny fluvial island may be visited without charge. Visitors pay for an inexpensive boat trip across the river, which is the only way reach the castle. The Castle of São Jorge is a castle that occupies a commanding position overlooking the city of Lisbon and the Tagus River beyond. It was originally built by the Moors, but in its present configuration the strongly fortified citadel dates from medieval times. It is one of the main historical and touristic sites of Lisbon. The gardens of the Castelo are beautiful and well maintained. A five-arched Ogival House, once part of the 17th century jail located within St George Castle is worth seeing. The museum complex, the Interpretation Center for the City of Lisbon, is also worth a visit.